In early June, 2000, I was booked on the 20th Century Fox feature Dude, Where's My Car? in which I was to play a nerd-like cult member of some kind. I was sent to an 8am interview on Forest Lawn behind Warner Bros. and near Universal Studios. There pleasant 2nd A.D. Jim Goldthwait indicated the interview was "a formality," that he was certain I was booked. We were told the script was written by Philip Stark, currently also story editor for the entertaining TV series That '70s Show. I let them know my availability as well as certainly not minding a haircut. At the time the confirmed shoot dates were June 14th and June 13th with a possible June 14th (which didn't happen), as well as two possible night shoots June 29th and June 30th. The interview was Tuesday June 6th, and the four of us there were told we'd hear something "by Thursday." I got a page confirming the booking about four hours later. The next day I went to a wardrobe fitting and found the outfits we'll be wearing consist of a set of speedos... under a transparent hooded jumpsuit made entirely of bubble-wrap packing material...! The haircut length was, in fact, a tad shorter than even I usually get it, but I knew within a month it'd be back to a moderate length. As Zoltan cult member with Joseph Gonzalez. As usual I was given directions to the crew parking, not the location. As I take the bus it would have been considerably easier to tell me the location than the crew parking. Crew Parking was at Verdugo at Buena Vista, while the location was at Victory near Hollywood Way. The bus could have let me off at Victory and Hollywood Way. As it was, I stayed on to Verdugo and walked all the way to Buena Vista, there I was shuttled to the actual location of the Chinese food place. A pleasant surprise: now SAG as well, Joseph Gonzalez (from the Fox Sport Interactive [hockey] commercial I did), was also cast, an hour late due to road destruction around where the interview was held. I got my 7am call time for June 15th and directions thereto. Once again it's th'same area: 6th and Mateo area of Los Angeles! This was the same area where I did The Mexican three weeks earlier, as well as the Tire Kingdom commercial I did in early February. So I certainly knew how to get there, but the initial early call time made it... challenging, though far from impossible: I'd have to leave much earlier and take three buses. Thankfully (?) I did get a call mid-evening on the 14th with a morning call time change to 9:30am, so I knew I could take a different set of buses which would not be a rush. Taking the commuter bus I used to take to my previous day job, I got to 6th Street where my transfer bus was immediately pulling up, so I got to 6th and Mateo around 8am, that being directly next to the warehouse where I worked on the film The Mexican. Later I realized our location was the very same building that when I worked on the Tire Kingdom commercial, I went in to craft services twice, only to learn later it was an entirely different production there. Our holding area was where I entered at that time. A.D. Christine then realized some of we males were there "quite early" for our call, and kept apologizing profusely of Having Us Do Stuff while technically we were not yet on the clock. We were sent to breakfast, after which (when 9:30am had rolled around) our hair was checked, got a little make-up, etc. 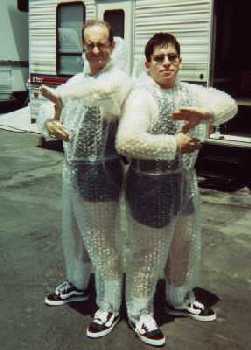 We changed into our speedos and were given our bubble-wrap jump suits. Director Danny Leiner used to direct the TV series Freaks and Geeks so he was experienced and quite efficient, occasionally using two-cameras for some of the shots. Both he and first A.D. Paul Martin were fair while certainly putting everyone through their paces. Our scenes involve our playing a cult of social misfits who believe that benevolent aliens are planning to take us away with them. The set was pretty close-quarters, so each of us in the "cult" was assured getting some good screen time. While trying to find their car, Seann W. Scott and Ashton Kutcher at one point end up infiltrating the nerd Zoltan cult as our leader (Zoltan), played by stand-up comedian Hal Sparks, gives a little speech of our soon leaving with the aliens " who like us." Bob Clendenin, of dozens of TV appearances, plays Zarnoff, Zoltan's second in command. Apart from doing numerous roles, I saw Bob in a CarFax commercial for which I'd also auditioned. In the film, Jesse (Scott) and Chester (Kutcher) not only have girlfriends, but inexplicably J they have gorgeous girlfriends, played by the ultra-adorable Jennifer Garner as Wanda, and Marla Sokoloff as Wilma. As we anticipated, the bubble-wrap outfits became mobile saunas, and quite quite hot to wear for extended periods (such as... on a film shoot). Hal and Bob was able to keep their humour throughout the day and keep cracking up those of us in front, mostly myself and Banzai Vitale who was playing Zabu (cast as he is a stunt man as well as an actor). The scene we shot June 14th entailed Zoltan's plans, Jesse and Chester infiltrating the cult and being discovered, and the fact that Zoltan has had captured the girlfriends of Jesse and Chester. Jesse and Chester are sent to retrieve a lost "Continuum Transfunctioner" which the cultists believe will let them go with the aliens. At the very end of the day we shot a quick bit of the cult, sitting on a long couch as Zoltan informs us that Jesse and Chester have obtained the Continuum Transfunctioner ("Quick! To my Mom's mini-van!"). We [the cultists] were wrapped at 10pm. The cult members included (but were not limited to) Rhonda Gureraero (getting her three SAG vouchers), Kyle Nudo, Alan Shoikhet, Scott Ditman (who was not only getting his three [plus] SAG vouchers, but it was the first film on which he's worked! ), and Michael Beardsley, who was kind enough to drop me at home Thursday night as he lives not too far away from me. Michael's call time the next morning was around 8:30am (as it was "just" a hallway scene), while the rest of the cult members' call time was 2:30pm! [so much for breakfast or for lunch...! 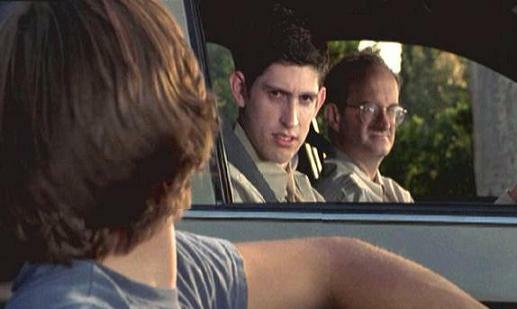 (or so I thought) J ]... Michael told me how he had been a "regular extra" on Freaks and Geeks, even having been on enough to acquire the character name of Humphries. Michael and I surmised that his having worked on Freaks and Geeks as much as he did may have "influenced" director Danny Leiner into hiring him and using him as much as he is doing (way cool!). The call time was 2:30pm for most of us, the day predictably running so late it completely scrambled and scrapped my weekend camping plans. I arrived at 1:30pm and we were not used until after 6pm (we did actually have lunch, the time slot "varied" from 2:30pm to 4:30pm as "three shifts," our segment being 3:30 to 4:30). With tons of time on our hands throughout the afternoon into the evening, I conversed with fellow stage actor Scott Ditman, learning that the Pasadena Knightsbridge Theatre could be a place to investigate as probable stage work. Scott was been performing there in the classic satire Lysistrata through July 2nd at the Pasadena "branch" (apparently there is a Los Angeles Knightsbridge Theatre as well). Unfortunately their web site offers no information regarding current or upcoming auditions, but Scott said he would keep me updated and when I can I will check out the place myself as well ("industry people" [i.e., with a SAG card] can see the shows there for free). Scott Ditman plays the cult guard who is guarding Wanda and Wilma (on the upper level as Zoltan points out to Jesse and Chester their captured girlfriends). Meanwhile veteran TV actor Michael Ray Bower (who plays one of the two main cult guards who gets bonked by a fire extinguisher), has a script being strongly considered over at Universal, but he's holding out as understandably he wishes to star in the comedy. Michael's follow-up to Dude... was the comedy Evolution in which his character literally saves the world. 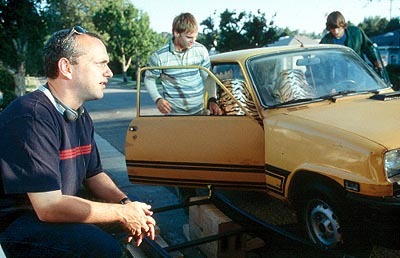 When we were finally brought in, we worked the scene set immediately prior to the scene shot the previous day. Ashton and Seann have bonked the guards and taken their bubble-wrap suits. While trying to find their way out, an alarm goes off, signifying the Zoltan-called meeting. They stop as the siren goes off, and turn to go the other way. In that reverse shot, it is I who exits first through a door into the hallway (followed by the quiet Kevin Christy), and turn (to my left/screen right) to head around the corner to the meeting. Ashton and Seann get swept along to the meeting room by Mary Lynn Rajskub as Zelmina (pre-Chloe of 24...). In one take while turning to face my door, Ashton tripped and slammed down on the floor (pretty much as he did during one take the day before as they were exiting). In both instances Danny did not yell "Cut," so the possibility exists that one of the trip/falls could be in the finished film. At the end of the sequence as they clear the hallway, a running Joseph Gonzalez brings up the rear as "the tardy cultist," as we later joked. As with Michael, as it turned out, Scott also lived quite close to me, he was kind enough to give me a lift home Friday night. Being wrapped at 11:18pm (to avoid giving us any overtime or meal penalties J ), it was far too late for me in any way to get up to the Angeles mountains for the planned and pre-paid weekend camping trip. We were told that when we were wrapped that night (i.e., our vouchers affirmed), we would be informed about our being used at the end of the month. When we wrapped we were told there was no way really to indicate if we (or which of us) might be used. Apparently it is a Wait And See deal. I was hoping/counting on my being used, as it would be three more (desperately needed) days of SAG work... I kept open those three dates. In the holding area, I was able to get a few photos of some of we cult members, but those next scheduled shoot dates are June 29th, 30th and July 1st (at the hair trimming, Jim told me they're doing six-day work weeks on this film). It turned out "none" of the cult members were used the final weekend of June as anticipated: only two of the "background" extras were used: Michael Beardsley and Alex. As Michael and I remained in contact, he was able to relay What Went On the other days. As for me (I thought at the time), that was all they wrote. At work I got paged with a call from Wendy at Central Casting for a call-back for shooting Saturday the 22nd (which was shifted to Tuesday the 25th... then to Monday the 24th). The call-time was 2:00pm; the bus was late but I got there spot on two, and after immediate wardrobe procurement, we waited around until they actually used us, around 4:30pm... They also did trim my hair, although not as short as previously. On set the main make-up hair lady was aghast that it had not been done properly but by then it was too late to rectify: shots had been done. Also on hand was Michael and Alex, Mary Lynn Rajskub and Turtle Lini, as well as Seann W. Scott and Ashton Kutcher. (Chapter 15 on the DVD), the scene involved the capture of the Dudes by the "harmless" cultists. Ashton drove the black open-top convertable while Mary Lynn drove one cult car, and I the other conveyance. With me driving, Michael was my passenger and Alex was Mary Lynn's passenger. Turtle hides in the backseat of the Dudes' convertable (Ashton is driving). They come to a stop sign and Mary Lynn pulls up along side their passenger side while our car pulls up along side Ashton. Our car follows Mary Lynn's car as she races north on the Burbank side street from Burbank Boulevard towards Chandler (we did not shoot at Universal). One shot (for Ashton's line about we [the cultists] being "harmless") is spot-on Michael (and I), as Turtle then subdues the Dudes with hand-held tazers. As the driver I am just beyond Michael (the clip of which would be shown twice times in the feature documentary Strictly Background). When Michael Beardsley and I were working together on the TV series sitcom Sabrina the Teenage Witch, Jim Goldtwait (who at the time was its AD), informed us that preliminary completion work on "Dude is so good" that it could be released in December 2000 instead of spring/summer 2001. Jim also told us that (we figured most likely through the IMDB entry page for Dude that listed the URL on which the content for this page sat, now resting here), director Danny Leiner "stumbled" across [this] very page and that he liked it! « (Hollywood Reporter) After 20th Century Fox moved the release date for the Baz Luhrmann-directed "Moulin Rouge" from Christmas to next summer, the studio has staked out Dec. 15 for the debut of the comedy "Dude, Where's My Car?" The youth-oriented film was originally slated for release sometime next year, but Fox executives saw an early cut of the film and loved it, sources said. 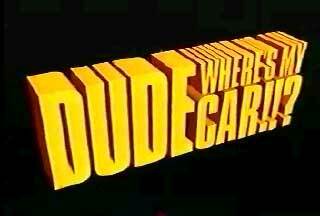 After realizing they could finish the film and make the date, the studio moved the PG-13-rated "Dude" to December. 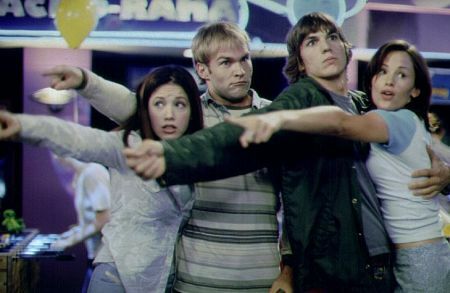 "Dude" stars Ashton Kutcher ("Reindeer Games"), Sean William Scott ("Road Trip"), Hal Sparks and Marla Sokoloff. In early December, Michael relayed he had just talked to someone that has seen the finished film at a test screening or such; that the friend thought it was very funny and Mike's coverage was very good. Arrangements to see opening day of Dude ran into a double snag with Michael catching a flu and my being booked on the in-production Rob Schneider film The Animal. ... I made it to the 5:00pm Twilight Showing of "Dude, Where's My Car?" [at the Mann Plant Theatre]. I liked it; it was brainless fun. 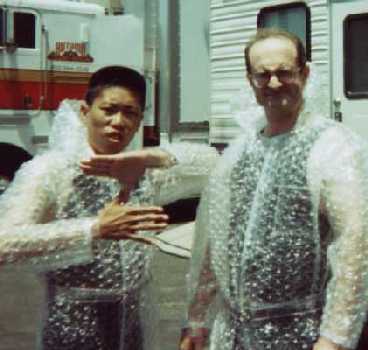 I don't think you mentioned that Seann was popping your bubble wrap suit; some good shots of you there. Brief but good shot of you and Alex walking the corridor too. As for me, I'm noticeable several times in the scene, particularly one, unfocused slightly as they're actually focused on Hal Sparks, shot over his shoulder while he addresses the Dudes. Also unfocused is the shot of me popping out of the door when the alarm goes off earlier: I don't know why Danny [Leiner] was concerned at how I exited the door the first take. The other-direction shot, with Joseph Gonzalez running last, shows him running but did not give the impression he was late or tardy and running to catch up, just that he was the last in the group. The "planning of" bonking Michael Ray and Bill Chott is great. Somewhat sit-com'y like but it works. I'll definitely be getting this on DVD. And remember, a movie is ended only when the blue rating graphic comes up... Being a Twilight Showing, the place was not exactly packed, possibly around ? capacity. The film has and got a lot of good solid laughs. Get well and go see it. Mike notified me of something surprising: "You are mentioned on the Dude DVD, not by name, but as being the guy that put together a website on Dude. Danny referred to you as "that guy in the driver seat" and said you were cool and mentioned that you'd had a diary website. One of the guys (not sure if it was Ashton or Seann) said 'That was the guy?'..." My big[gest] close up in the film is Chapter 15, and I'm in the subsequent cult scenes at the barn. Having previously been interviewed Cloverleaf Radio radio show on blogtalkradio, host Ian Falcon Boothby invited Bob Clendenin, Mike Beardsley, and me, to do something of a Dude, Where's My Car? radio reunion of sorts. Interestingly enough, as Michael and I had stayed good friends all this time, he and I ran across Bob at a film festival at which one of our projects had also screened. Today's radio show was done live, from 3:30pm-4pm'ish Pacific Time; we were wrapped at 4pm, and Ian stayed on for a few more minutes. Michael Beardsley and I arrive in Dude, Where's My Car?